Steel and wood overhead doors, insulated or non-insulated: Clopay, Northwest, Kinnear, Steel-Craft and Richards-Wilcox. 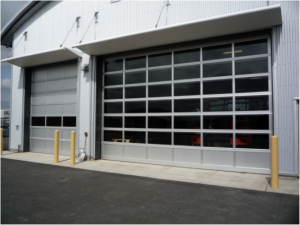 All glass, aluminum framed overhead doors: Clopay, Northwest and Steel-Craft. Security aluminum gates and operators. Swing door operators: FAAC and Dorma. Bollards for traffic control or equipment protection. High speed gates/doors: Rytec, TNR and Albany Assa Abloy. Parking lot barrier arms and sliding/swing gates: FAAC. Pay stations / ticket stations: Cale. Rolling steel doors: Clopay, Kinnear, Cookson, Overhead and Cornell. Sliding and rolling grilles for interior security: Mobilflex, Dynaflair, Dynamic, Dagendor, Clopay and Amstel. Steel fire shutters and doors: Clopay, Kinnear, Cookson and Cornell. Counter shutters: Aluminum, stainless steel and wood. Truck doors and parts: Whiting, Trucdor and Todco. Airplane bifold hangar doors: Schweiss. Moveable walls and accordion doors: Woodfold. Sliding barn door hardware: Richards-Wilcox. Replacement hollow metal entry doors and closers. Harbour Door Services has the largest supply of replacement parts on Vancouver Island. We specialize in the repairs and maintenance of parkade gates (overhead and sliding), grilles and doors. Replacement of springs, cables, rollers, hinges, treadle hose, weatherstrip, etc. The security receiver tracks individual transmitters via number or position. This allows the Strata / Owner to add or delete individual transmitters within the system without affecting existing users. The Strata / Owner maintains a master list of transmitter numbers linked to each owner or tenant. This allows lost or stolen transmitters to be deleted from the system quickly and easily without disturbing the other users. These security radio controls are only sold and programmed through authorized dealers. We can co-ordinate with the property management firms and/or Strata to ensure security and convenience. Harbour Door Services offers regular scheduled maintenance contracts for your equipment. 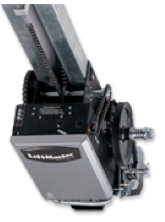 This maintenance will extend the life of your equipment, reduce the cost of repair and maintain safety features. The safety, convenience and reliability that you expect from your parkade system can only be guaranteed with regular, scheduled maintenance by a qualified service technician. We can arrange for regular maintenance quarterly, bi-yearly or yearly based on your individual equipment needs. We can work with building strata representatives, or property management companies to arrange/provide maintenance on an on-call basis, regular contract maintenance, as well as 24-hour emergency service. We do new construction projects, as well as replacement parkade doors and access systems. We can provide matching aluminum in fill, fencing and pedestrian gates, to further secure parkade/parking areas. We also offer special “quiet package” systems to help reduce vibration noise, from the door system, for units above/beside parkade, includes vibrasonic isolators and special precision rollers. We can upgrade your standard springs to a higher cycle spring. This will provide you with a spring with a longer life cycle, which means fewer repairs. Harbour Door Services can help with your commercial project!